Prop. 123 amends the Arizona Constitution to increase the annual distributions from the state land trust permanent funds to schools, universities and other public institutions from 2.5 percent of the average market values of the funds to 6.9 percent for the next 10 fiscal years. The state land trust was established when Arizona became a U.S. territory in 1863, setting aside parcels to benefit schools. The state Constitution requires distributions from the state trust lands to public schools to be 2.5 percent of the market values of the funds through Fiscal Year 2020-21. In 2000, Arizona voters approved Prop. 301, which includes a requirement the Legislature adjusts education spending for inflation. In 2010, the Arizona Education Association and other parties sued the state and state treasurer (Doug Ducey at the time), claiming lawmakers did not adjust education funding for inflation during the recession years. In 2013, the Arizona Supreme Court ruled the Legislature had violated the Voter Protection Act and owed schools about $1.3 billion. In 2014, a Superior Court judge ordered the state to reset the base level of its K-12 funding and pay $331 million more per year to schools as compensation. The Legislature appealed and agreed to settle with the plaintiffs. That settlement is Prop. 123. If passed by voters, the proposition would provide $298 million to schools in June and $300 million next fiscal year. If the proposition fails, the lawsuit continues. Proposition 123 could bring $2 million to MUSD over the next two years. It is also controversial among Arizona voters. It has divided Republican from Republican, Democrat from Democrat and education supporter from education supporter. Is the settlement the best deal the schools can get in a timely manner, or should they continue to sue for everything the courts have ordered, or is the funding formula in Prop. 123 too unstable for its purpose? Prop. 124 amends the Arizona Constitution to create an exception in the public retirement system to allow adjustments to the Public Safety Personnel Retirement System in approved Senate Bill 1428. Gov. Doug Ducey signed SB 1428 on Feb. 16, creating a new retirement benefit structure for public safety personnel hired on or before July 1, 2017, without a significant raise in taxes. It included a new mechanism to create a cost-of-living adjustment. The Arizona Supreme Court determined Article 29, Section 1 of the state Constitution prohibits adjusting down a future permanent benefit. If approved, Prop. 124 would replace the permanent benefit increases for retired members and their survivors with a compounding cost-of-living adjustment. The COLA would be based on the average annual percentage change in the Phoenix-Mesa consumer price index. No arguments against Prop. 124 were filed with the state’s election office. 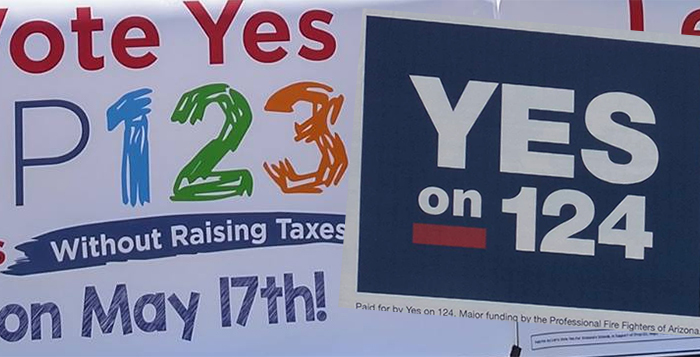 Article does not state it, but there are quite a few very SOLID arguments AGAINST Proposition 123, including the state treasurer. Read your voter informational packet that was delivered by mail last week. In a nut shell this constitutional change will band-aid the system for 10 years while digging into the Trust's Principle for 10 years. At the end of 10 years the trust will be much smaller, and the Educational funding will be in a worse situation than now. This is similar to the City of Maricopa Override request (that has been rejected for I believe 6 years in a row), just on a much grander scale when you consider the potential Budget Apocalypse after these 10 years. So think long and hard before you help your children, but DOOM there's. I say no!!! Continue with the LITIGATION and make the STATE Pay the Educational system in Arizona what was approved in Prop 301 in 2000 that they chose to illegally ignore! AND SHAME ON YOU INMARICOPA.COM for not mentioning that there are arguments.